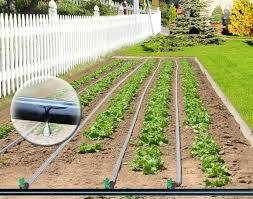 Drip irrigation is the slow and precise delivery of water to chosen plantings. It uses flexible polyethylene tubing with devices for dripping, called emitters. The systems are easy to install. Require no trenching and the only tools needed are pruning shears and a punch. 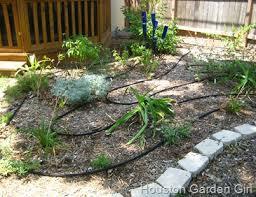 For many gardeners, water conservation is the main reason for installing a drip system. 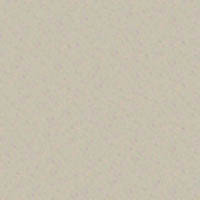 When you water your garden, your purpose is to water plants rather than soil. Drip irrigation gives you the ability to put water exactly where it's needed and keep paths and areas between plants dry. This reduces both waste and weeding. Traditional watering methods deliver water faster than most soils can absorb. If water exceeds the soil's percolation rate, it runs off the surface, taking valuable topsoil and nutrients with it. 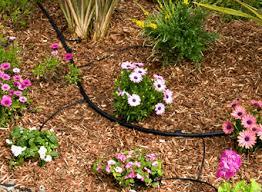 Drip irrigation also allows you to water a large area from a small water source, since it uses water more slowly than other methods. The greatest advantage for home gardeners is time savings. 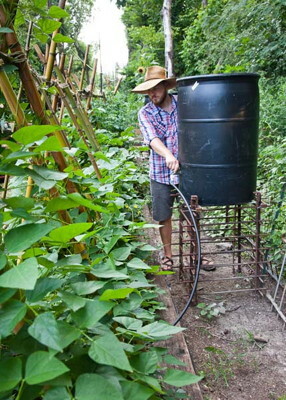 The simple action of opening a spigot replaces all the time spent watering by hand. With the addition of an automatic timer, you can cope with a busy schedule while your garden flourishes without you. In developing countries, workers like these people had to carry buckets of river water to irrigate their row crops. Now modern technology and much larger "buckets" save them time and energy by allowing drip irrigation to do the work for them. All our starter kits are designed specifically for small size gardens and can be fully automated by adding zero pressure timers. This soaker hose is specially formulated to work with any gravity fed system. It works with little or no pressure while other soaker hoses require 10-25 lbs. of pressure to operate efficiently. This kit is unique due to its flexibility. Not only can you manually insert the emitters on the main line tubing but you can also put them on the ends of the smaller tubing to reach plants further away. This kit is great for short rows, small or irregularly shaped garden beds and square foot gardening. 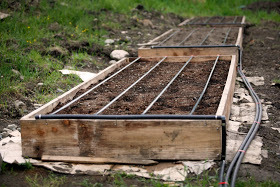 This kit is specifically designed for longer row crops and extensive square foot gardening.